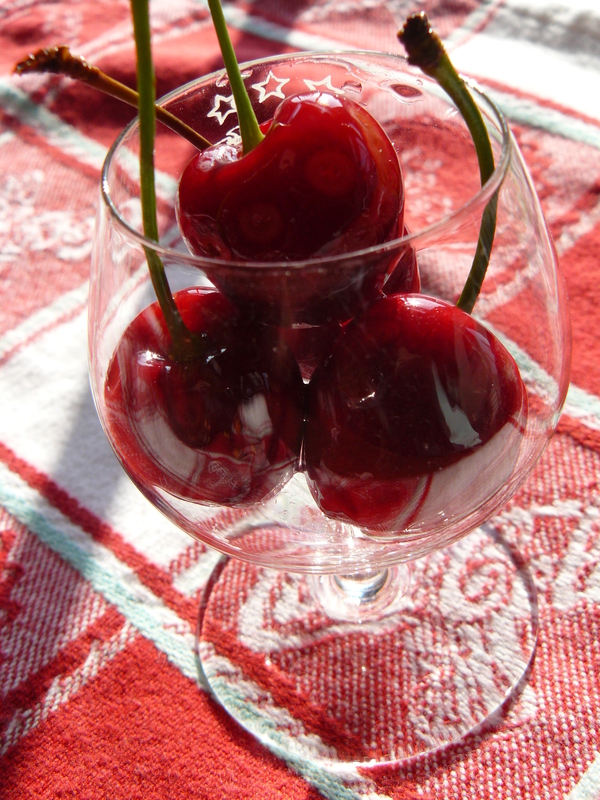 Tipsy Cherries: Cheers three ways! Ahh, drunken fruit–what could be a more fun way to add fruit and antioxidants to your day? Two plus pounds of cherries later, I made my way home from Belltown Hill Orchards with thoughts of getting them nicely liquored up. But how? Poke holes? Yes, that would help get the job done in style. Being in a whimsical sort of mood, I couldn’t resist poking smiley faces on each little guy. These odd little summer jack-o’lanterns, smiling at me from their jars on the shelf, made me chuckle more than once today when I opened the fridge. 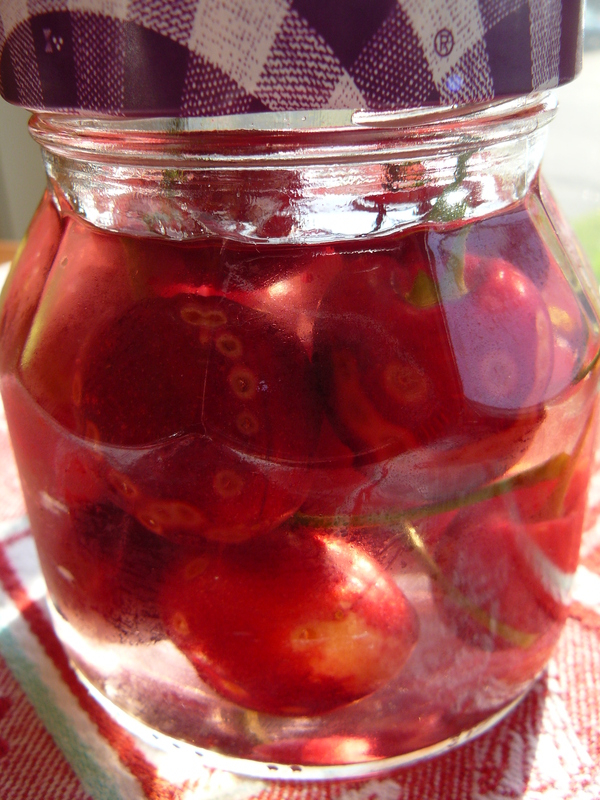 After poking the holes, I filled three jars with cherries, then covered one with rum, one with vodka and the last with 43 Liqueur. Tonight, I dipped two out of the three jars in chocolate. New jack-o’cherries have been recruited to hang out and get happy in the fridge. Life’s a bowl of tipsy cherries–cheers to that and to you, too! They’re darned tasty with or without a chocolate dip. 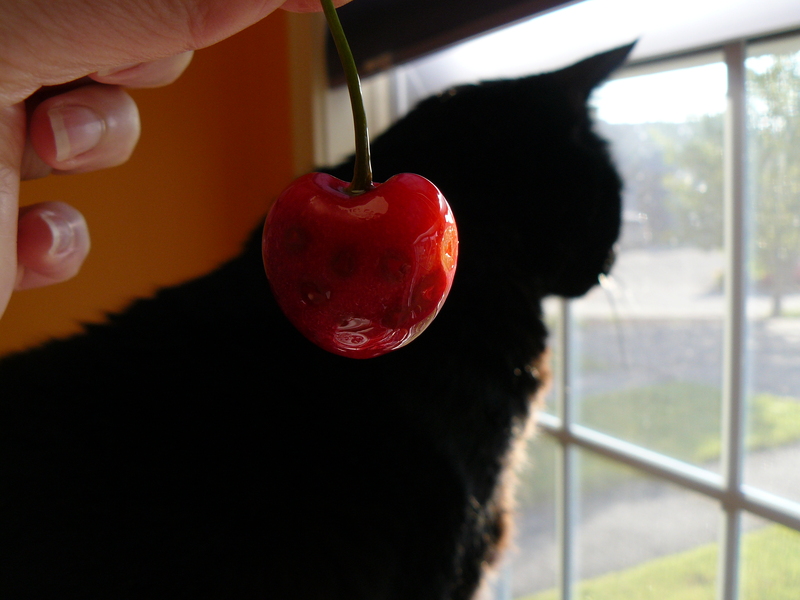 April Katt keeps a watchful eye on the cherries. 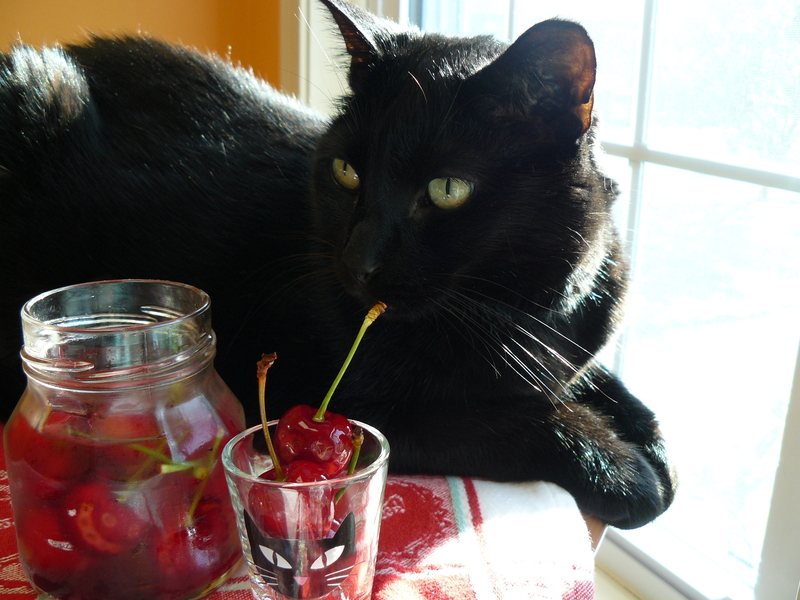 Cherry cheers from our kitchen to yours! cheers to you too, I’m going to have cherry-dreams. can’t wait to try you cherry-rum recipe. thanks for sharing. I heard through the grapevine(Facebook) that you were cooking up some boozy chocolate cherries and they sure do look yummy, too bad you can’t share with me! Oh gosh, they look unbelievably fantastic! April cat is such a cutie pie! @BiscuitBoy, it’s a tough call, isn’t it?! @Sweetums, April is my heart! @momgateway, bet you love them…a great excuse to go pickin’! 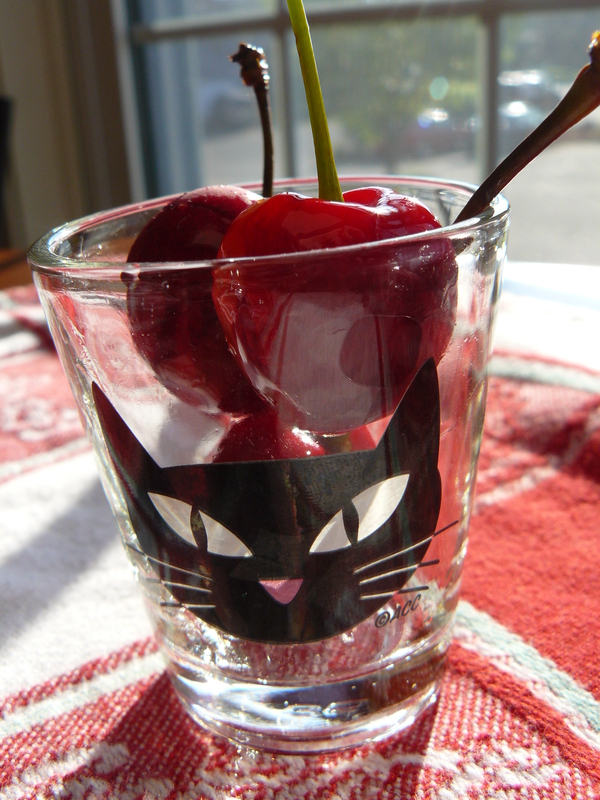 I bet the rum soaked cherries came out the best…Cool shotglass too!